"Tan Lines" is a newly-built, beach front, dream home ready for your stay. Located in the beautiful west end of Panama City Beach. Tan Lines is a gorgeous 6 bedroom, 6 full/2 half bathroom home that sleeps 24 people. Located on the beach with a private pool. This home sits next to "Sun Daze" and "30A Away." Step inside where you will find on the 1st floor a sitting room with a TV, an additional refrigerator, a half bath, and kitchenette. 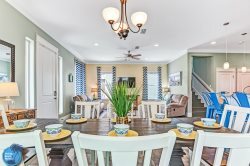 Head out the back door to the spacious back deck with plenty of space for sun bathing, grilling on the charcoal grill, or watching the waves. The large 2nd floor of the home includes the main living area with a queen sleeper sofa, a fully stocked gourmet kitchen with stainless steel appliances, a half bath, and large dining space. The great open floor plan allows everyone to be part of the group, while enjoying the ocean views. Located on this level is 1 king bedroom with an en-suite and terrace access as well as 1 queen over king bunk bedroom with an en-suite. The pool and deck area sit right outside the door on the 2nd floor main living level. Tan Lines boasts a beautiful deck with seating and dining. Enjoy the picturesque sunsets from this level. Up on the 3rd floor you will find 2 exceptional king masters with en-suites. Both bedrooms have pristine views of the ocean and sliding glass doors that lead out to the top floor balcony. Relax upstairs in the additional TV sitting area with two sleeper chairs. The 3rd floor also has a custom bunk nook with a full / twin / twin bunk set and an additional king bedroom. Unwind in the king or queen over king bunk room with en-suites. Tan Lines is equipped with all the personal touches of home. This home is perfect for large or multiple families to enjoy the beauty of Panama City Beach. Tan Lines is 1 of 3 homes that sit side by side. Perfect for groups needing additional space. Please look at our other homes Sun Daze and 30A Away. *Additional cost applies to heated pool.